Former Albion captain Adam Virgo. Former captain Adam Virgo believes Brighton's 'excellent recruitment' is behind the club's recent success and why they are so close to sealing their place in the Premier League for another season. 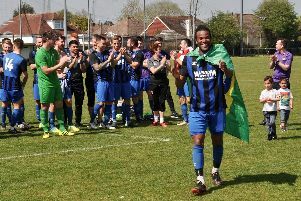 Albion are 12th in the top flight with eight matches to go and although Virgo admits he was slightly concerned when the club failed to sign a striker in the summer, he always thought they would have enough to stay in the Premier League. Despite bringing in the likes of Mathew Ryan, Davy Propper, Pascal Gross and Markus Suttner - and then Jose Izquierdo and Ezequiel Schelotto later in the summer transfer window - the Seagulls were tipped by many pundits to be one of the three clubs who would be relegated. However, they have not been in the relegation zone all campaign and Virgo, who played for the Seagulls from 2000 to 2005 and 2008 to 2010, said: "If they finish where they are now at the end of the season, I think that would certainly be a surprise but the one thing Brighton have done, not just this season but in previous seasons too, is their recruitment has been excellent. "Paul Barber, Chris Hughton and everybody that's involved in signing players have to take a massive amount of credit for that. They've not gone and spent the £25m to £30m on a player to try and keep them within the league. "Pascal Gross for £2.5m is arguably one of the best buys in the Premier League, let alone in Brighton's history. "They've done very well in the transfer market. "I was slightly concerned at the start of the season that they didn't sign a striker but Glenn Murray has stepped up to the plate and has been excellent. "In the last two years in the Championship, I don't think Chris was given the cheque book in January enough to see them over the line when this year he was given (Leonardo) Ulloa and (Jurgen) Locadia to give them a few options from the bench. "Shane Duffy and Lewis Dunk have also been excellent all season and Dale Stephens has improved game by game. "I always thought they had enough to stay in the division, although I didn't think they had enough to be where they are in the league at the moment. "They've been very difficult to beat and stability-wise at the moment, the club is in a very good place and everything seems to be running nicely. "For a first season in the Premier League, if you exceed expectations that can only be a positive. "You don't want to be where Southampton are at the minute and scrapping for points. "I still think one more win would guarantee them being in the Premier League but I've got nothing but praise for the club this year. "They've held their own and it's only the Liverpool game where they've been for a better word battered. Even the Chelsea game, I know they lost it (4-0) but they had chances and maybe if they'd got a penalty and stuff like that it would have been different, so it's only really been the one game they've been completely outplayed. "There's been games where they've been poor, Huddersfield away, West Brom away and Everton away. "You can be poor on your day but Brighton haven't really been outclassed in too many games, which I can only see as a massive positive going into next season." Adam Virgo has set up his own academy which offers weekly training sessions at various locations across Sussex for boys and girls aged between five to 19. For more information, visit www.adamvirgoacademy.com, email info@adamvirgoacademy.com or follow @adamvirgoacademy on Facebook and Instagram and @AcademyVirgo on Twitter. Look out for an exclusive interview with Adam talking about the academy in our Sussex Newspapers titles in paper and online in the coming weeks.